What? A collection of multiple-choice and short answer questions for discussion and reflection in an upper-level undergraduate quantum mechanics course. Designed for use with clickers, Peer Instruction, or Just in Time Teaching. Based on research on cognition and student difficulties in quantum mechanics. Why? 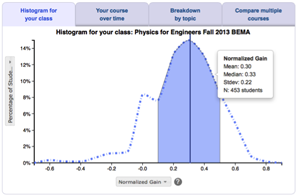 They use visualization tools to help students build physical intuition about quantum processes. They keep students actively engaged in the learning process. They bridge the gap between abstract quantitative formalism and qualitative understanding. They can supplement your existing materials. Why not? You might prefer to use different research-based materials designed for quantum mechanics courses, such as Paradigms in Physics or CU upper-division QM curriculum. You can access the resource materials for free, which include the "ConcepTests" for assessment with continuous feedback to the students, standardized assessment tools, reflective questions and the material for Just-In-Time Teaching (JITT) for quantum mechanics courses, from the PhysPort QuILTS curriculum page. Please look at the first two links here for the ConcepTests (Quantum Mechanics 1 and Quantum Mechanics 2) and the last four links on the page for standardized assessment tools, reflective questions and the material for Just-In-Time Teaching (JITT) for quantum mechanics courses. C. Singh, M. Belloni, and W. Christian, Improving Students' Understanding of Quantum Mechanics, Phys. Today 59 (8), 43 (2006). C. Singh, Student understanding of quantum mechanics, Am. J. Phys. 69 (8), 885 (2001). C. Singh, Student understanding of quantum mechanics at the beginning of graduate instruction, Am. J. Phys. 76 (3), 277 (2008).